This botanical print is inspired by a quotation attributed to W.B. Yeats. From the Northern Lights to wildflowers, nature rewards inquisitive observers. Inspired by a quotation attributed to Irish poet W.B. Yeats ("The world is full of magic things patiently waiting for our senses to grow sharper"), Carolyn Gavin's botanical print celebrates the optimism of knowing that new discoveries are always in the offing. Having grown up in South Africa and traveled throughout Europe, Carolyn brings her love of exotic color and natural beauty to this inspiring design. 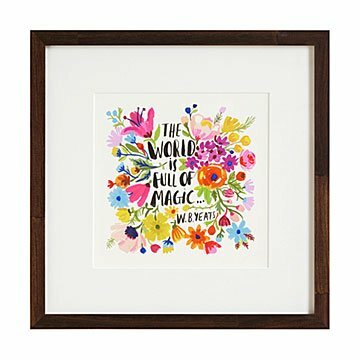 In an office, living room, or bedroom, it will serve as a reminder to search, wonder, and dream. Digital print from Carolyn's original watercolor and gouache painting. Designed in Toronto. Printed in Portland, Oregon. Read a Q&A with Carolyn and step inside her studio on our blog. Exotic color, travel, and nature inspire Carolyn Gavin's work, and for good reason. She grew up in South Africa, traveled through Europe, and landed in Canada where she lives in a 120-year-old Victorian house in downtown Toronto with her husband, daughter Lily, and English Bulldogs, Eggroll. Carolyn trained as a graphic designer in South Africa (the "old-fashioned way," she notes) and now runs the creative side of a family-run stationery business founded with her brother, Mark. She works in gouache, watercolor, and vector to reflect the vibrant beauty she sees in the world. When not drawing or painting, Carolyn reads, rides her bike, does yoga, and gardens to relax. She’s inspired by the buzz of the city as well as the serenity of the country.